CAPE CANAVERAL — Fifty years ago today, missile pioneershere thrust the United States into a space race with the Soviet Union,launching America's first "man-made moon." Ike Rigell and Terry Greenfield peered through tinted greenbulletproof glass in a blockhouse at Launch Complex 26 as an Army rocket lit upnight skies over the Atlantic coast. Kelly Fiorentino stood in a Quonset hut on an island in the Bahamas, ready to transmit a second-stage ignition signal — a precisely-timed switch-flip criticalto propelling the Explorer 1 satellite into orbit. And on that frigid Friday night in Huntsville, Ala., Norm Perry and dozens of Army Ballistic Missile Agency workers shivered beneathloudspeakers in a downtown square. A telltale beep-beep finally blared out about an hour and 45minutes after launch, signaling mission success. The crowd erupted in cheers. "We had no idea it was in orbit until it had completelygone around Earth," said Perry, 74, of Titusville. "As soon as itcame across, the whole square heard (the beep). We heard it, and we wentwild." Four months earlier, on Oct. 4, 1957, the Soviet Unionlaunched Sputnik, the world's first artificial satellite, a 184-pound spherethe size of a medicine ball. Then less than a month later, on Nov. 3, the Soviets sent upa half-ton orbiter with a living, breathing creature, a dog named Laika. The American public panicked. The back-to-back Sputnikscreated hysteria. Fearful people realized Soviet rockets were powerful enoughto rain nuclear bombs on U.S. soil. Anytime. Anywhere. Duck-and-cover drills were stepped up in local schools. Theneighbors started building backyard fallout shelters. There was acoast-to-coast crisis in confidence. America was losing, and losing badly, a ColdWar battle for technological and ideological supremacy. "You know, Oct. 4, 1957, was a pretty black day for America," said Rigell, 85, of Titusville. "The whole nation had been humiliated." The U.S. had been enjoying a post-World War II boom. It wasa time of peace and prosperity. The country considered itself the greatestnation on Earth. "And the Soviets — the communists — had an artificialmoon up there, and we were still on the ground," Rigell said. wake-up call. America's initial response was an explosive failure. 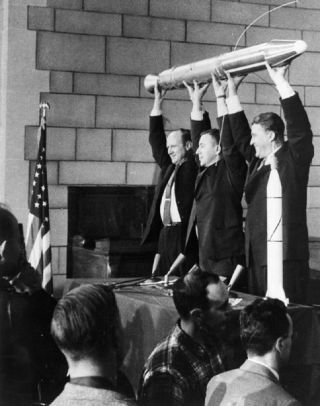 In a hurry-up bid to restore confidence at home and prestigeabroad, the administration of then-President Dwight Eisenhower announced thatthe U.S. would launch a satellite by year's end. Then on Dec. 6, 1957, a Navy rocket topped with agrapefruit-sized spacecraft rose four feet off its launch pad before its enginelost thrust. The Vanguard sank back onto the pad, its fuel tanks ruptured andthe rocket was engulfed in a spectacular, nationally televised explosion. "There's ignition. We can see the flames. Vanguard'sengine is lit and it's burning," NBC News correspondent Jay Barbree, now73, of Merritt Island, said during a live TV broadcast. "But wait, wait a moment, there's, there's no liftoff!It appears to be crumbling in its own fire. It's burning on the pad! Vanguardhas crumbled into flames. It failed, ladies and gentlemen. Vanguard hasfailed!" The public was disgraced, dismayed. Derisively dubbed"Flopnik" in newspaper headlines the next day, the failure wasassailed as yet another devastating blow to national prestige. "It was horrible," said Fiorentino, 77, or Merritt Island. "It was a horrible sight to see." As fate would have it, Plan B already was well under way. Five days after the second Sputnik launch, the Eisenhoweradministration quietly hedged its bets by giving the U.S. Army BallisticMissile Agency a green light to proceed with preparations to launch asatellite. Working outside the media spotlight with German scientistWernher von Braun, Maj. Gen. John Medaris led a push to launch a four-stagerocket based on the Army's proven Redstone ballistic missile. The Jet Propulsion Laboratory in Pasadena, Calif., wasenlisted to scramble up three solid-fuel upper stages as well as a sciencesatellite. Medaris promised to get the job done within 90 days. What followed was a 24/7 effort that was cloaked in secrecy. "Medaris put the Army-JPL project strictly underwraps," JPL author Franklin O'Donnell wrote in an Explorer 1retrospective. "Movements of the project's key personnel were workedout according to elaborate decoy plans. Work at the launch site at Cape Canaveral — visible from public beaches — was hidden with scaffolding and canvastarps." Surreptitiously shipped as "Missile 29," thefirst-stage of the rocket arrived at Cape Canaveral in late December and washidden away in a hangar. Erected at pad 26A on Jan. 16, its upper stages andthe Explorer 1 satellite were added as a scheduled Jan. 29 launch dateapproached. Launch preparations reached a feverish pitch, but thenorthern hemisphere's jet stream dipped down to Florida, producing 180 mphwinds aloft. Medaris was eager to get the launch off on schedule, butLaunch Weather Officer John Meisenheimer issued a "no-go" forecast. "General Medaris was not pleased with the forecast, butI couldn't do anything about that," said Meisenheimer, 74, of Orlando. "In fact, he was really, really not pleased." Under significant pressure to reverse his call, Meisenheimerknew the strong high-altitude winds and an associated shear could blow therocket off course or rip it apart. Then Maj. Gen. Donald Yates, commander of the Air ForceMissile Test Center and a master meteorologist, "called me up and said, 'Lieutenant,give them the forecast that you see,'" Meisenheimer recalled. "Don'tlet any pressure get to you on your forecast.'" The young weather officer stood firm. The launch wasscrubbed on Jan. 29 and again on Jan. 30. Then the Jupiter C rocket finally blasted off at 10:48 p.m.Jan. 31, propelling America on course to catch and ultimately surpass theSoviets in a race to the moon. For Rigell and others involved, it was a sight and a nightto savor. "You couldn't get tired of hearing the breakingnews," he said. "We had a satellite in orbit." Published under license from FLORIDA TODAY. Copyright 2008FLORIDA TODAY. No portion of this material may be reproduced in any way withoutthe written consent of FLORIDA TODAY.